Zebra GX420t - 203 dpi, thermal transfer, EPL & ZPL, USB/Serial/Ethernet 10/100/ Ethernet, US cords. This is the TAA compliant version of printer (Part# GX42-100410-000) for government purchasers. Please call for more information. Zebra GX420t is easy to use, flexible and reliable. The Thermal transfer Zebra GX420t has the easiest ribbon-loading system around. The GX420t produces 203 dpi print resolution at speeds up to 6 ips, and like all GX models, it's well-suited to a variety of applications and industries thanks to a wide choice of options. The Zebra GX420t features a wide range of options including 802.11b/g or Bluetooth wireless connectivity and 10/100 Ethernet, in addition to standard USB/serial/parallel. 6ft USB cable (USB 2.0, A to B). Replaces (Part# USB-5000-02M). External ZebraNet, 10/100 PrintServer for all Zebra tabletop models (110Xi, ZM, ZT) and any desktop zebra printer with a parallel port. 10ft USB cable (USB 2.0, A to B). Replaces (Part# USB-5000-03M). 2" x 1" Direct thermal paper label. 2,340 labels/roll, single roll. Also available as a case (Part# 10010028). 2.25" x 1.25" Direct thermal polypropylene label. 2,000 labels/roll, single roll. Also available as a case (Part# 10010063). 2" x 1" Thermal transfer polypropylene label. 2,100 labels/roll, single roll. Also available as a case (Part# 17154). 2" x 1" Thermal transfer polyester label. 2,530 labels/roll, single roll. Also available as a case (Part# 10002629). 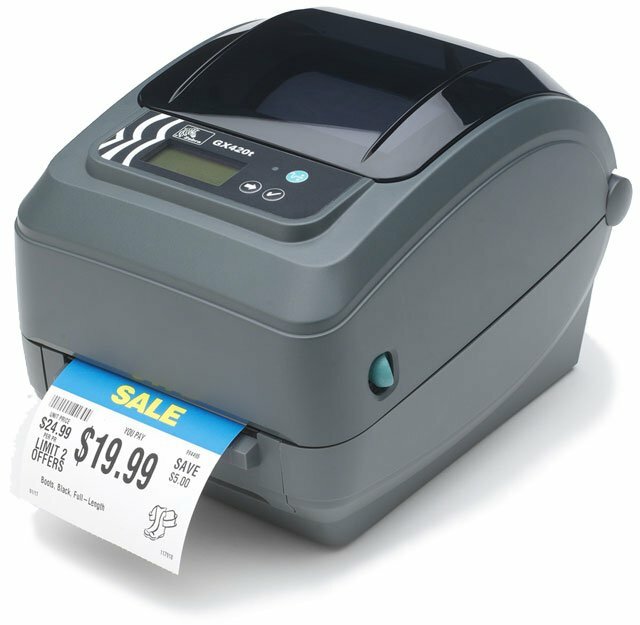 The Zebra GX42-100410-0GA is also known as GX42-100410-0GA	or GX421004100GA	.